I belong to an Audio Drama group over on Facebook, and the question came up about “how do we promote ourselves?” As a long-time audio drama writer and fan, this is something I’ve talked to other theater troupes about, as well as authors, musicians, and visual artists. Since most (i.e. none) audio theater groups have a budget to do a lot of advertising, doing a little DIY personal branding is going to make a big splash. It will help you find an audience, grow your network of listeners, and by cooperating with other groups, help you cast a wider net to find audience members who are already interested in audio theater as an art form. Here are ten things you can start doing to grow your audience. Cast of Decoder Ring Theatre, an audio theatre company in Toronto. 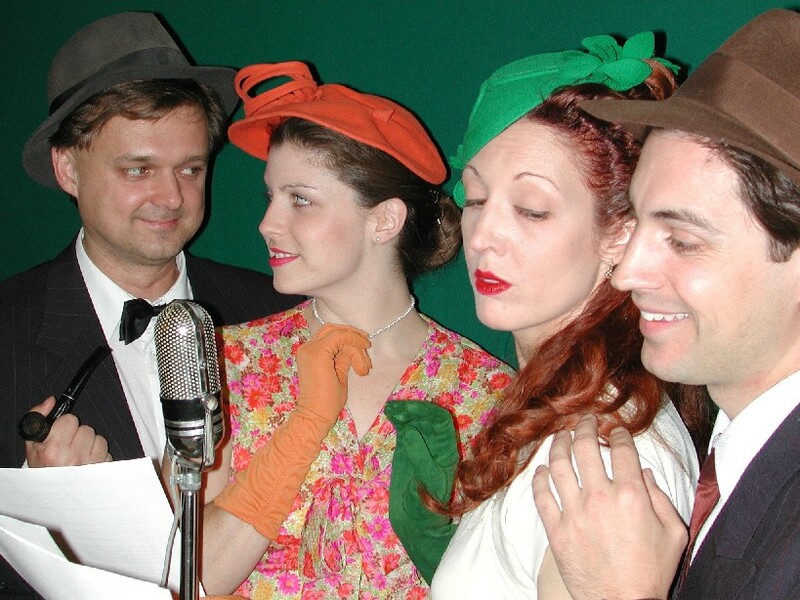 They produced a few of my radio plays several years ago. Advertise on Facebook. Set up a Facebook advertising account and create ads to appear only to specific people who fall within a certain age range, gender, family status, work status, and so on. Figure out who your Typical Listener is (soccer moms in their 30s, college students, etc. ), and start targeting people who fit that persona. Write some ads, set a daily budget of a couple bucks, and then post the ads. Be willing to spend $40 – $50 per month for 3 months as a test. Set up a co-operative catalog company. Not actually a company, but just a clearinghouse website that contains all the different audio dramas out there. Everyone who’s involved chips in a few bucks, and that’s how you pay for the Facebook advertising. Advertise that company, rather than individual productions, and you can advertise longer, reach more people with diverse interests, and increase each other’s audiences. Plus, a website this big (possibly with a blog) is going to start winning Google searches for keywords like radio theater, audio theater, and so on. Create an email newsletter. You can either create your own email newsletter, or create one for this co-op website. Feature one or two audio dramas per issue. Everyone who’s a fan of ANY of the dramas can subscribe, and then you’re reaching a combined audience of everyone’s listeners. (I recommend MailChimp, because they have a free option.) If you start your own newsletter, it’s still a good idea to feature other favorite audio dramas in addition to your own work. Do that for each other, and introduce new artists to your audience. Do giveaways for fans, and ask them to share your work. Hold random drawings for sharers, and give away small prizes. Ask them to share your new episodes and other content with their own social networks, especially Twitter and Facebook. Give prizes for the most creative, the biggest reach, and so on. Advertise each other’s work on your own podcasts. At the end or in the middle of an episode, during a “commercial break,” play a preview of someone else’s show. Sort of like Amazon’s, “People who like this also bought X” feature. People listening to your podcast may also like this other podcast. Again, do this on a cooperative sharing model, where you create a “ring” of advertisers. A shares on B, B shares on C, C shares on A, etc. Build a Twitter following. Do a basic Twitter search, and find your Typical Listeners. They’re the ones talking about horror movies or superhero adventures, or whatever you’re producing. They talk about it in their bios, or they talk about it in their tweets. Follow those people, and then put them in a Private Twitter list that you watch daily. Talk to those people, respond to their tweets, answer their questions. Build relationships with them. They’ll want to support you because you’re Twitter buddies. Follow certain #hashtag topics on Twitter. Is there something happening in the news that ties into your audio drama? Set up a column for that particular term and see if there are any tweets you can respond to. (Use Tweetdeck to easily see and respond to your lists.) Then, when it seems appropriate and not creepy, respond to a tweet with your own. Don’t be ham-handed and say, “Oh, we wrote an audio drama about that. Here it is!” Rather, just participate in the conversation naturally. If people are interested in you and want to know why you’re interested in the subject, they’ll check out your Twitter page. Hopefully you’ve got your audio drama and the website in your Twitter bio. Don’t forget the visual element. Audio drama may be for the ears only, but if you can add a visual element to your work, do it. If you do live recordings, create a video of those, and post them to YouTube. If you ever perform live in public, share it on Periscope or Facebook Live video. Take photos of people creating the audio drama, and post those to your Instagram account and Facebook, and turn those into stories. And if you’re a fan of the old radio technology, take photos or find others, and post those to Pinterest. Your content may not be for the ear, but there’s still a visual element worth sharing. Write audio drama reviews. Whether you post it on your own blog, or even if you started the co-op company in #3 and blog for it, review other audio dramas. These don’t have to be critiques and criticism, as if you’re a movie critic. Rather, write a review, where you discuss things that happened, what you enjoyed, etc. (Remember, you all know each other, so don’t be an a-hole!) Publish those reviews as guest articles in as many places as you can too, where others can read them. If you focus on just two or three of these items, you can expand your audience of listeners and fans. Then, just be sure to use Google Analytics to measure traffic to your website, Twitter analytics to see how your audience is growing and how they’re engaging with your tweets, and then your podcast analytics to see if any growth there coincides with your new social media efforts. Want to know about artist branding and social media promotion? 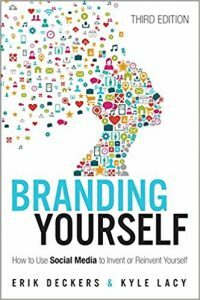 Check out my book,Branding Yourself: How to Use Social Media to Invent or Reinvent Yourself. The book is now in its third edition, and is published by Que Biz-Tech, an imprint of Pearson Publishing.